Chicago Bicycle Accident Lawyer | Illinois Bicycle Lawyers at Keating Law Offices: What's the "RIGHT" Way to Use Hand Signals While Biking? What's the "RIGHT" Way to Use Hand Signals While Biking? and it's approx 18" from finger tip to arm pit. hand signal if it's not already ? Thanks in advance -Paul P.
This is a timely question as last year the Illinois General Assembly passed a series of changes to the Illinois Vehicle Code as it relates to bicycling. You can see a summary of those changes in this Bicycle Law in Illinois post. 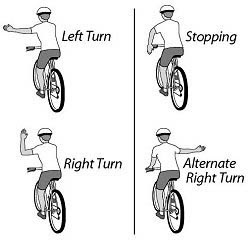 A bicyclist properly signals a LEFT TURN by extending their left hand and their arm horizontally (straight out). A bicyclist properly signals a RIGHT TURN by extending their left hand and arm upward (in an "L" shape) OR by extending their right hand and arm horizontally and to the right side of the bicycle (straight out and to the right). Prior to last year's changes in the law, a right turn could only be signaled with the "L" signal with the left arm/hand. With the changes a bicyclist can essentially "point" with their left or right arm which direction they intend to turn. left arm out with their left hand pointing down. It is the law in Illinois that motorists MUST keep a minimum of 3 feet between their vehicle and a bicyclist when trying to pass. This 3-foot distance also takes into consideration that bicyclists need only ride as close as is practicable AND safe from the curb. The clear intention of the legislature in amending these laws was to make the roads safer for bicyclists and enact legislation that enforces drivers to respect bicyclists. As to Paul P's question, he may signal to drivers that they are too close by extending his arm and signaling with 3 fingers that the driver is too close. However, I would not recommend it and there is no Rule of the Road currently in the law that requires this. An extended left arm with or without 3 fingers extended too closely resembles the current hand signal for a left turn. The problem, therefore, is that you intend to warm the driver to keep their distance, but they think that you are signaling a left turn. Bicyclists are entitled to a fair and equal use of the roadways. Illinois as a state has made great strides in enacting legislation that protects bicyclists. However, if your rights as a bicyclists have been violated and have resulted in an injury from a bike accident, or you have any questions about this blog entry, please contact Mike Keating of Keating Law Offices at MKeating@KeatingLegal.com.